While teaching editing and proofreading at UNLV, one of my students asked for tips on inspiration. Since inspiring yourself was fresh in my mind, I started with that (even though there are plenty more). Most of those tips are more creative than strategic. However, there are some strategic elements to writing that anyone can apply. One of them is simple enough. It's something copywriters learn (often indirectly), but the technique is also employed by others — including John Irving, author of the World According To Garp, The Cider House Rules, and A Prayer for Owen Meany (among others). Author John Irving starts at the end. How about you? Irving never writes a novel or a screenplay without knowing the ending first. He doesn't only need to know what happens at the end. He has to know the exact sentences themselves. He needs to know the atmosphere and tone. He considers all of it an "end note" to whatever he works on and toward. The reason he does it is most stories have already happened before they can be told. It's often the conclusion that helps writers determine whether or not the story is worth telling. If you are late for a meeting, for example, you might tell why you are late if the cause was traffic, road construction, an accident, or some other event worth telling. You might not tell the story if the ending is unwritten — your struggle to always be on time, absentmindedness, or the inability to allot enough time. You can take this step a bit further. Knowing the end is also what drives the inspiration. If you know the ending is exhilarating or interesting or educational, deciding how to begin tends to be more engaging for you as well as any future readers. There is an excitement. Applying the end to advertising, journalism, and public relations. Advertising. For advertising copywriters and marketers, the end can be determined in something as simple as a tagline (not the call to action, which is something else). The more timeliness the tagline — Just Do It, Drivers Wanted, We Try Harder, A Diamond Is Forever, and Got Milk? all establish the end of a story. When the end of the story is strong, the rest of it will fall readily into place: It gives weight to Nike showing us extraordinary athletics applied to ordinary people. It gives meaning to the right Volkswagen being found by the owner/driver. It shows what Avis needs to do in order to overcome not being the biggest. So on and so forth. As for the campaigns you don't remember, many of them have weak taglines or none at all. The campaign probably doesn't have any resonance to tie its individual pieces together. Maybe the story becomes so overinflated with creative that it's difficult to remember the point of the piece. Journalism. New stories aren't much different. The end frequently gives away where the writer's head was at while they were writing the piece (even if they didn't know it themselves). It's always in the last few paragraphs where they button up their stories, conveying their own bias toward atmosphere, tone and foreshadow. Sure, they might not always know the ending as verbatim as Irving might, but the ending almost always shapes the story: who they interview, how facts are prioritized. It's how they decide what story slant to tell, with the only difference being how heavily they allude to the end. And if they are any good, they are willing to change that end if their research, sources, and compilation of facts don't bear it out. Public Relations. When you look at news releases, you'll likely find that the best of them have some semblance of an end while the worst of them (and most of them) do not. Or more specifically, the best of them sound like news stories. The worst of them do not (and many sound like weak marketing). Part of the problem is how it is taught. So much emphasis is place on the first graph in the inverted pyramid that many press releases become vanilla. The same can be said about pitches. The best of them lead with two thoughts — the tease and the end — telling journalists exactly why they might care. The worst pitches are facts, without even a hint at why it was written beyond some client telling them to burp something out. It's not all the practitioner's fault. Many businesses don't have an end in mind. How the end means more than how you get there. It doesn't matter who you talk too. Listen for the end. 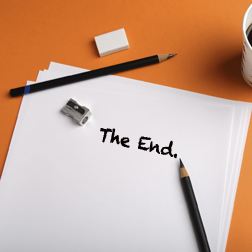 Great leaders, great communicators, great speakers, and great writers alway know the end before they begin. It's the end that resonates. I was in a business meeting the other day and I left feeling uninspired. It didn't take long to figure out why. The executive who called the meeting didn't have an end. He talked about problems, organizational charts, and push back from investors. But he didn't have an end. There was no win. If he did have an end, it was grounded in uncertainty. It reminded me of a job applicant I met a few months ago when I was helping another client screen for talent. All he talked about was how much he hated his job and could not wait to leave. His story had an end, but not for the company he wanted to move to — unless that end was simply going to mirror the one he told. Contrast this with anyone successful and you might notice they always have an end. It might be conveyed in a vision. While that vision might be subject to change from time to time, you can still wrap your head around. It's the end that inspires people to listen just as it inspires what someone might write.